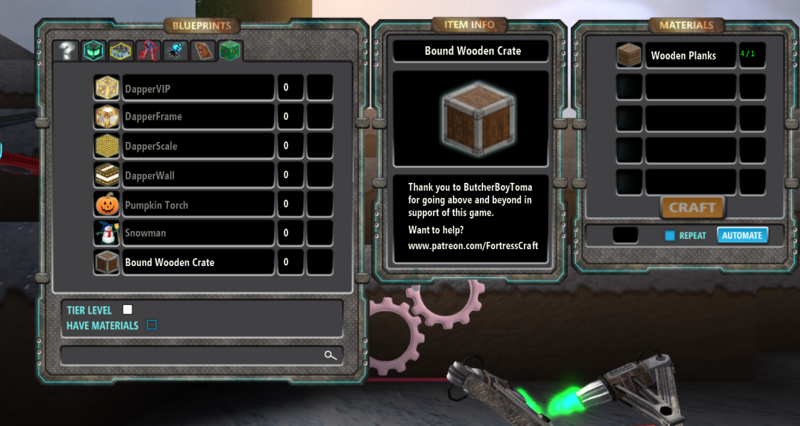 FortressCraft is a complete, released game. However, like Diablo 3 and Team Fortress 2 before it, it's not a finished game. I love my game, and I want to add so much more to it. ...and more are being added and suggested daily. As a dev, I get a very small proportion of the proceeds from the sales of the game (Tax, Publishers and Valve all whittle that away). Whilst it is doing quite well right now, thanks to DireWolf20, TangoTek and friends, to continue to work on the game long-term requires a lot more money than the game is currently making - and by 'long-term' I mean the next 5 to 10 years. PCs are gonna get a lot faster in that time! The advantage of Patreon is that it's regular, guaranteed income - as an added bonus, it gives extra motivation to get the next mainline patch out! Steam income comes and goes; Summer and Winter sales are AMAZING - whereas the lull around February/March is horrible. Just to be clear, this is mainline releases, not the daily Bleeding Edge patch! I've requested a 'private' DLC AppID from Valve, and Patreon backers above $10 should receive that. This will, at a minimum, contain a unique skin, a unique ARTHER skin, a unique SpiderBot skin, and access to the TechAxe. Help us build the Community Pack rewards! I plan to continue releasing patches on the same cycle as currently. This is roughly 2 weeks of frantic feature addition, 1 week of polish, and 1 week of bug testing. This should mean patches come out roughly once a month. There is also planned to be exclusive access to the Patreon-only Creative and Survival Dedicated Servers, once the hosting is live. A little above the minimum. This includes everything in the above tier, plus you get a world named after you. Keep it clean. Pick any of the current Creative-Only blocks and have it craftable in the main game for everyone, and have it dedicated to you. Flavour text is negotiable. This would allow me to hire a full-time 2d artist. This covers textures, icons and all other non-3d based media.This represents a fairly-low band wage of £25k/$35k.